High Batts Nature Reserve is private and only accessible to subscribing members or to visitors by special arrangement. Access to the site and to the Hides is controlled via key coded locks. There is an annual Open Day when non-members are welcome to visit to tour the Reserve, join in events and observe activities such as moth trapping and bird ringing. You can find out more by going to the Events page. 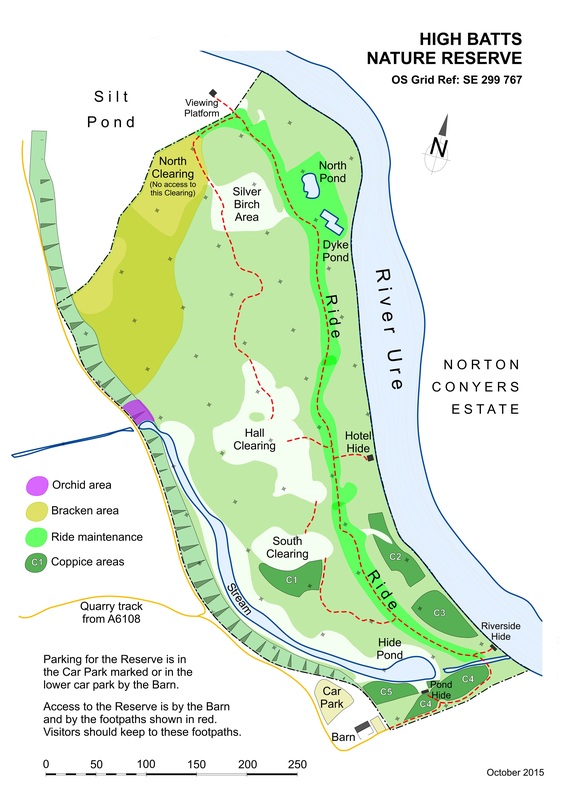 Within the Reserve, visitors should keep to designated footpaths. There is wheelchair access to the main Pond Hide, but other footpaths around the Reserve are mown and are subject to rabbit and mole damage, which precludes use by wheelchair users. A welcome is extended to groups who wish to arrange a visit and learn about the Reserve and its wildlife. This is not limited to natural history organisations, and people with a wide range of interests from walking, photography, art and general adult education can come and discover its calmness and delights. Please contact us if you are interested in visiting. High Batts is an ideal venue for school parties and can provide many learning opportunities relevant to the national curriculum. We have educational material relating to key stages 1 and 2 which is available for teachers wishing to bring pupils on visits.